Kyiv is a capital of Ukraine. It is also considered a centre of spiritual and cultural life of the country, a symbol of continuous historic traditions. Kyiv is an ancient city with the 1500-year history. A great number of architectural and historic monuments of the past have been preserved on the territory of the city. Kyiv is often called a “City on seven hills”, “City of churches”, “Cradle of the Russian cities”. Nature and architecture, the ancient times and modern times have been mixed together. One day is not enough to visit and see all the attractions, monuments and parks of this magnificent city. Therefore, it’s better to have several days for a visit and maybe, come for a long weekend. 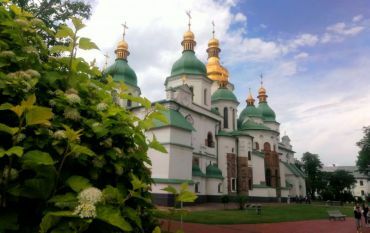 When visiting Kyiv it’s well advised to start a sightseeing tour from visiting ancient historical temples, for example, the famous Saint Sophia Cathedral, also known as Sofia Kyivska. It is one of the most outstanding architectural monuments of the Kievan Rus’ age. Many times Sofia Kyivska has been quoted in Ukrainian poems and literature as a symbol of Ukraine. At the end of the 20th century, the city best known landmark was inscribed in the UNESCO World Heritage List. Saint Sophia Cathedral is located in Volodymyrska Street. The easiest way to get there is taking a metro, getting off at Maidan Nezalezhnosti Station and then going up along Sofiivska Street. A real masterpiece of the Ukrainian and world architecture to see is Kyiv-Pechersk Lavra. It is a huge cave monastery complex preserved from the times of Kievan Rus’. The monastery was founded under Yaroslav the Wise reigning in 1051. The Lavra occupies a large area. Its territory includes the cave system with the preserved incorruptible relics of the saints. This is truly a holy place. Today, the Lavra is visited by thousands of people from all over the world who come to pray and see its wonders. Kyiv-Pechersk Lavra is listed as a UNESCO World Heritage Site. The monastery can be reached by taking a bus № 527 or № 24 from Maidan Nezalezhnosti Metro Station located down the street from Saint Sophia Cathedral and getting off in Lavrska Street, where the monastery is located. Another symbol of Kyiv recommended to see is the Golden Gates located in Volodymyrska Street. It was the main entrance to the capital during the time of Kievan Rus’, the most ancient defensive structure. The Golden Gates structure houses a museum revealing the ancient foundation of the fortress built to protect Kyiv. 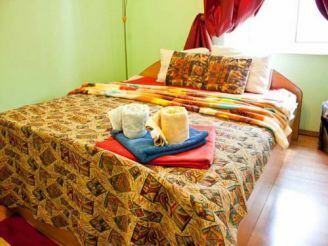 The attraction is located near Zoloti Vorota Metro Station. One of the must-do things is to walk along the main street of the city – Khreshchatyk. 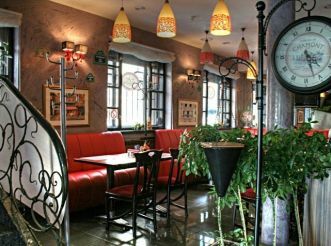 Here you can see a lot of interesting from the architectural point of view buildings, enjoy nice aroma coffee or tea at local cafes, listen to street musicians and actors, or participate in various street contests. Maidan Nezalezhnosti neighboring Khreshchatyk is the main square of Kyiv and the most popular place among the city residents and guests. Maidan hosts various entertainments. The main sightseeing of the square is the Monument to Independence, a 52-metres column crowned with a female statue of the Virgin Orans dressed in Ukrainian national costume with a cranberry branch in hands. Maidan also houses the Monument to the Founders of Kyiv – Kyi, Shchek and Khoryv, and their sister Lybid. Maidan Nezalezhnosti looks especially magnificently in the evening in the light of lanterns. From there, you can go directly to one of the most beautiful temples of the city – St Michael’s Golden-Domed Cathedral located in Triokhsviatytelska Street. St Michael’s Golden-Domed Cathedral can be reached from the central Kyiv square by walking up along Kostelna Street. The great value of the Golden-Domed Cathedral is its paintings executed in accordance with all the Biblical canons. In front of the entrance to the Cathedral one can find a monument to Princess Olga, as well as statues of Slavic educators Cyril and Methodius. The right bank of the Dnipro River hosts the highest monument on the territory of Ukraine – the Monument to Motherland. The monument can’t be missed to see. It is a memorial complex dedicated to the events of 1941-1945. The statue of a woman with a sword and shield in hands is 103 meters in height. The observation deck is on the 37-meter high level. For thrill-seekers climbing to the top of the shield of 92-meters height can be arranged. From the top there is a stunning panoramic view on the Dnipro River, golden cupolas of Kyiv cathedrals and monasteries. The statue houses the War Museum. The monument can be reached by taking a bus № 527 or № 24 from St Michael’s Cathedral. Kyiv is also famous for a very bizarre building, which can’t be passed without admiration. It is a unique construction of the architect Gorodetsky – House with Chimaeras built in 1901-1903. The building acquired the name due to the abundance of sculptures featuring various unusual animals, inhabitants of the underwater world, world of fantasy creatures and attributes of hunting. Nowadays, it is the Residence of the President of Ukraine, where official ceremonies are held. 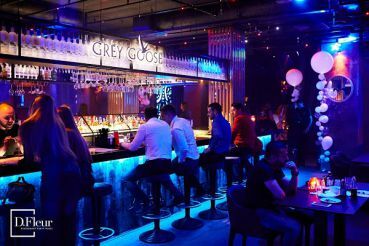 To get to the place is easy from Khreshchatyk Metro Station access in Instytutska Street and going up along Bankova Street in which the building is located. Kyiv also houses many castles and palaces among which a special attention must be paid to the stunning complex of Mariyinsky Palace. The palace was built in the 18th century in the style of Baroque for Empress Elizabeth of Russia (daughter of Peter the Great). Since its construction the palace hosted many visits of the Imperial family. To reach the palace is easy by walking from the House with Chimaeras along Sadova Street. 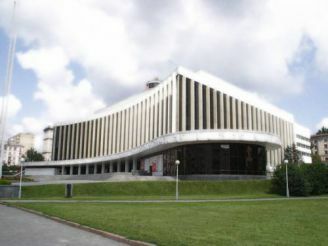 Theatre-goers will appreciate high-quality shows and concerts staged at the Taras Shevchenko National Opera, the Ivan Franko National Drama Theatre, the Lesia Ukrainka Drama Theatre, the Tchaikovsky Kyiv Conservatory. You can continue exploring the city in St Andrew’s Descent, also known as Andriyivskyi Uzviz. It is not just a street but an open-air art gallery, an endless market of various souvenirs. The street also houses many museums and art galleries and is marked by historical landmarks, including the castle of Richard the Lionheart, stairs to Zamkova Hora Hill and a stunning religious construction of the 18th century baroque St Andrew’s Church located on top of St Andrew’s Descent. Andriyivskyi Uzviz can be reached from St Volodymyr’s Hill. On St Volodymy’s Hill you can enjoy walking in the same name park. The scenic views of the Dnipro River, the quay, the floating bridge and the hydropark give the park a special charm. St Volodymyr’s Park hosts many pavilions, bizarre sculptures like a kissing bench in the form of lips or a huge statue near the Museum of Water, as well as other interesting monuments. Here, you can find the bridge of lovers where couples in love or just married leave by a tradition for happiness their ribbons and locks as symbols of love and hope to be together forever. In front of the bridge there is a sculpture of a couple of the old-aged people hugging each other. The park can protect from the heat and hide from the city bustle. If you are interested in the history of Ukraine, you are well advised to visit the ethnic outdoor museum "Pyrohiv" It takes 30 minutes to reach the museum from downtown. 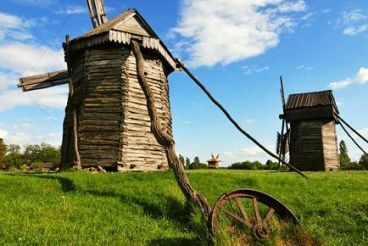 There you will see the Ukrainian constructions of the 17th – 20th centuries: the huts, wooden windmills, churches. Each hut in Pyrohiv is a small museum reproducing the atmosphere where Ukrainian peasants used to live. To see everything you might need all day, so you are well advised to plan your day well in advance to enjoy the sightseeing of unique monuments of the Ukrainian architecture. Experienced guides will tell you about the use of certain facilities and household items. A tour bus operating on the territory of Pyrohiv, will make your travel within the museum more comfortable.